So, he may as well have said, “Have a bloomin’ Christmas and a freakin’ New Year!” Right. OKAY. So, there you have it! It’s one more holiday weirdness to wrap our brains around. For the final day of weird Santa week, I’m busting out the rest of the bad Santa photos in a Grand Finale slideshow. Voila! Tell us which is YOUR favorite. 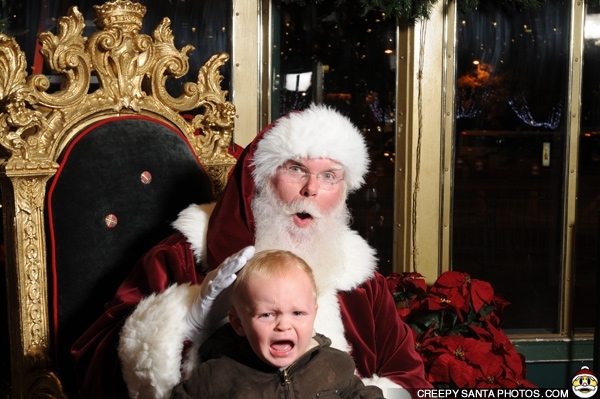 The lighting and the faces in this weird Santa photo seems to point to a pre-photo backstory. My proposal is that just before this was taken, Santa give little Buddy here a rap on the noggin with his gloved knuckle. We’d like to read your theory. Write a caption, or the backstory of this ODD photo! Things were so innocent and sweet in the old days…um. no. Santa wouldn’t put up with any nonsense. As shown here, back in the day, if you weren’t good, Santa would bag you at Christmas, water board you, and you’d never be seen again. "You've been naughty." Elves were kidnapped kids? pajamas who smells like Irish Coffee. HO. Ho. Ho. 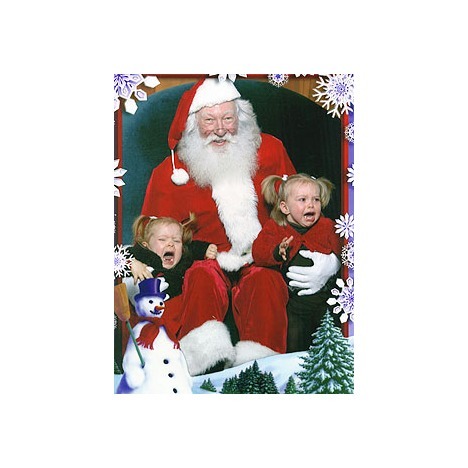 Were YOU scared of Santa as a kid? Double the Christmas photo Jolliness! Welcome to weird Santa week. Each day, I’ll give you a picture for your amusement. 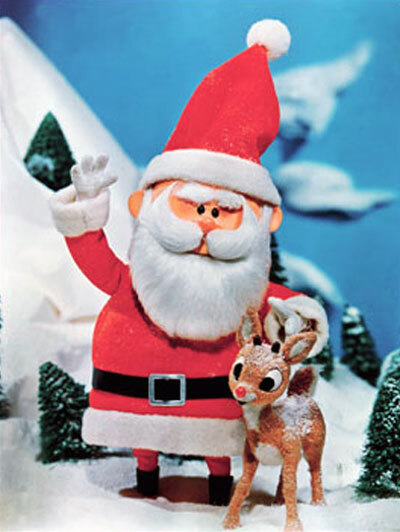 Do you know any kids who get freaked out by the fat and jolly stranger in the fake beard? 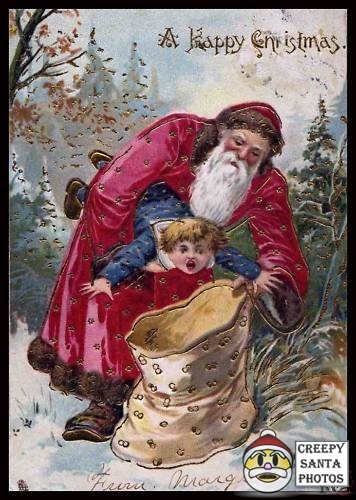 Do you have a weird Santa picture? Add a link to share it with us. What did they say to each other? Santa looks about to cry too. I do like the Christmas season songs. 1. Baby It’s Cold Outside is not even a Roofie away from an ensuing crime scene. 2. Rudolph the Red Nosed Reindeer tells a tale of a heard of reindeer bullies, who come to conditionally love a special needs reindeer, but only after he proves useful to them. 3. Santa looks either like intrusive government, or an ungracious deity in an upcoming advent in Santa Clause is Coming to Town. 4. What do sleepy newborn babies enjoy more than anything? Drum solos! 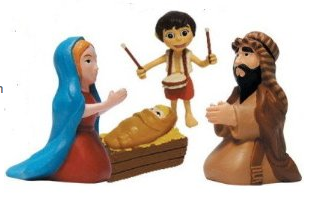 The song Little Drummer Boy couldn’t have been written by a mother, or caretaker of infants. This racket is a song racket. What are a few of your favorite Christmas time songs and why? I enjoy Silent Night, a lot for its spiritual poignancy. But, even if there was a mood of inner peace, I doubt it was that quiet in crowded Bethlehem, or in a stable of animals and an infant. Are there any songs, you’d like to never endure again? Or maybe you can make one up! I’m giving out something especially fun this Christmas, but first, I want to wish all of you a very Merry Christmas, and hope that 2010 will be a blessing for you. When I started this blog in February 2009, I didn’t know what would happen. I couldn’t imagine the outpouring of kindness and devotion that would come. I started with about 10 hits/visitors a week, and now I get that many by 6 a.m. Thank you all for coming along with me this year. I will be working on this blog, writing almost every day to engage the heart and mind, and injecting fun and humor as well. Plus, in February, I like to give gifts, because it’s my birthday month, so stay tuned for that too, if you like getting amusing, or helpful goodies in the mail. I thank you so much for your friendship and support. Technology can produce wonderful connections, growth, healing, and joy. It has for me, and I hope you find it here too. I encourage you, if you haven’t in a while, to check the blog categories, and archives to see what you’ve missed. This is the time of year when my family and I celebrate the advent (arrival) and the most gracious gift of Jesus, the Incarnation. 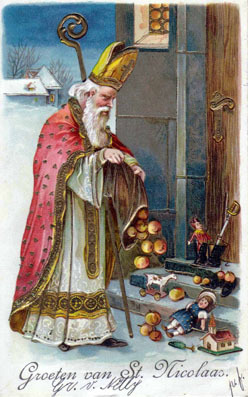 In the spirit of generosity, inspired also by St Nicholas, and many other spiritual giants, I’d like to extend an opportunity to all of you, by way of a contest for a special and very fun Christmas gift. I wish I had the resources to give each one of you this funky gift, I found while cruising around the “interweb,” but alas, the joy of giving will still be there, and I’m SO excited to send it out! 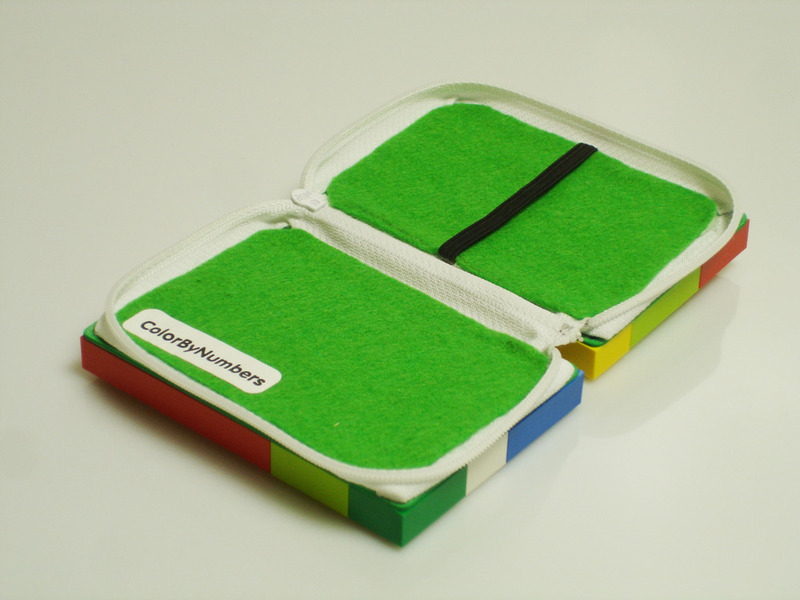 This handmade wallet is quite the neat treat. 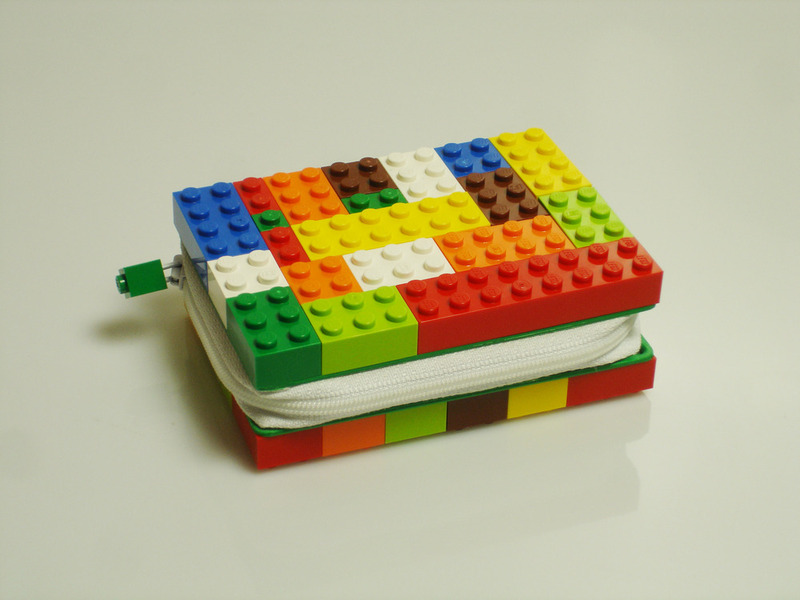 Made from genuine legos, it’s a snazzy gear for holding plastic cards, bill money, keys, tissues, mints, coins, chap stick, receipts for Christmas gifts you have to return, or other small objects. It’s a fun conversation starter, or a unique gift for a lego lover, (especially a “boy,” ages 5-55). It will also be enjoyed by anyone (male or female) with a taste for fun, or a penchant for innovative, and creative design. 1. Follow Life As Prayer on Facebook and Twitter http://LifeAsPrayer.twitter.com, and send out a message about it. 3. Send 2 friends (new visitors) to view the LifeAsPrayer blog, and have them leave a comment containing your name.